the last night at the Cabane de Bertol is a must-do, and we will enjoy the last final descent down to Zermatt. D0. Meeting in Chamonix at 6pm the latest, gear check and trip briefing. D1. 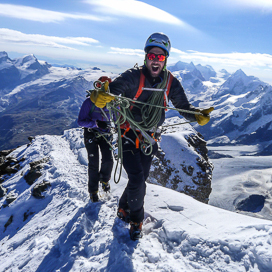 Kick-off with the spectacular descent down the Vallee Blanche. We take the Aiguille du Midi cable car to ski down the glacier to the Mer de Glace and Montenvers. Overnight in hotel down in Chamonix. D2. Starting early in the morning with the first bin, we get to the top of Grands Montets with cable car. 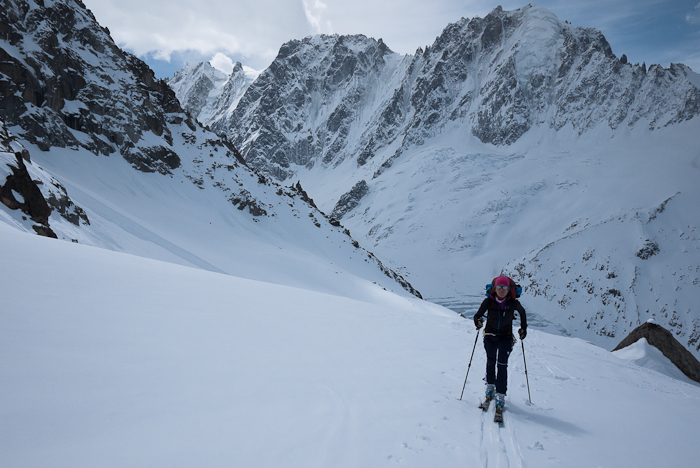 Ski down the Argentiere basin and skin up to Col du Passon / Col du Chardonnet (depending on snow conditions). Once we reach the Glacier du Tour, we ski under the Cabane du Trient and go back up shortly to the Col des Ecandies. Time for the last beautiful run down the Vallon d’Arpette to reach Champex for the night. D3. Taxi transfer from Champex to Le Chable near Verbier. We get to the top of Col des Gentianes taking the lifts in Verbier, then we put the skins on to climb up the Col de la Chaux and Col de Momin to the top of Rosablanche, 3336m. With a wonderful ski descent we reach the Cabane de Prafleuri for the night. D4. From the Prafleuri Hut we ski down the Lac des Dix and accross the Pas du Chat and Pas du Chevre. 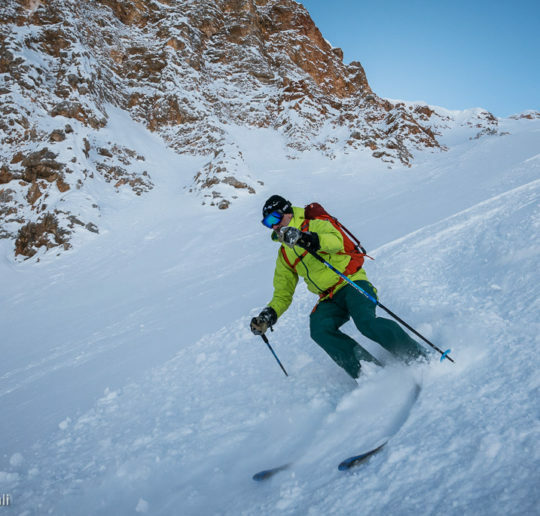 We ski down to Arolla to spend the night in our comfortable hotel. D5.From Arolla, taking the ski lifts, we carry on up the moraine of the glacier and skin up to the Cabane des Vignettes. Depending on conditions and timing there’s the option to climb to the top of the Pigne d’Arolla, Haute Route highest peak. D6. From the Vignettes Hut up to the Col de l’Eveque, and then ski down to the Plans de Bertol, skin up to the Cabane de Bertol, the beautiful little hut perched on top of the mountain. D7. This is the last day of the trip, we skin up to the Tete Blanche and finally a great long run down the glacier, close to the Matterhorn North face. We’ll ski down towards Schonbiel and further on to Zermatt. Back to Chamonix by taxi / train. WHEN: on request, from the end of march to the end of april, 4 ppl max. COST: 1230€ pp,with 2 participants. NOT INCLUDED: all transfers as per itinerary,lift passes for the guide as well, meals and overnight staying in the huts as per itinerary ( participants and guide), all extras. All these costs should be around 1800€ ( with a group of 2 ppl plus the guide,all extras are not included). 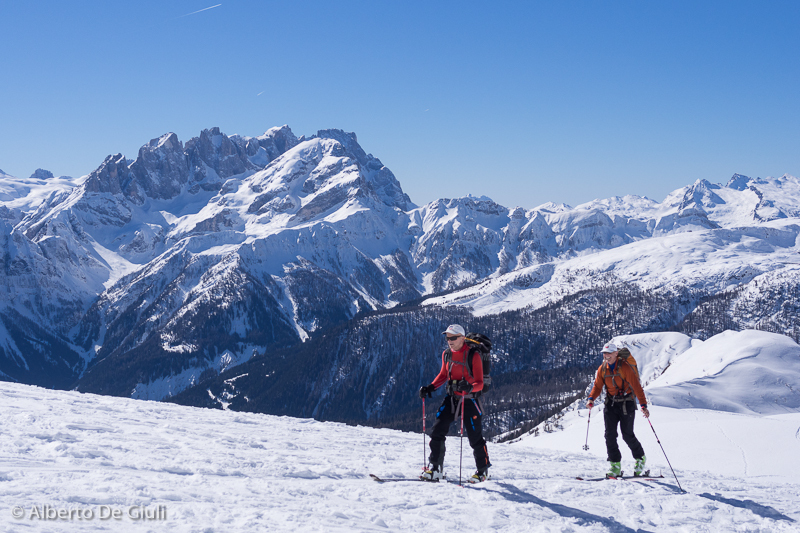 Skills and stamina: good skier with good fitness level as a ski tourer. 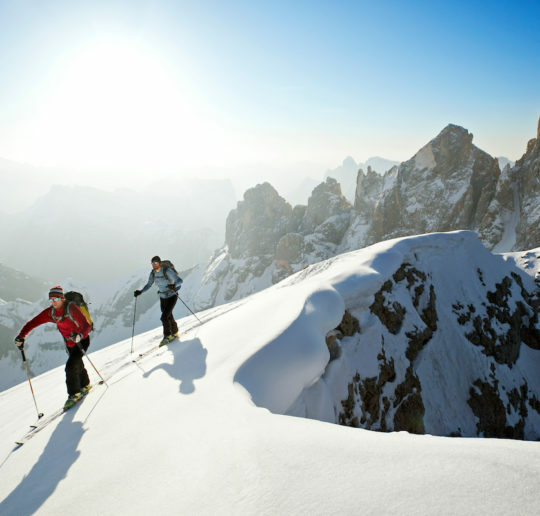 Vertical gain: the average daiyly vertical gain is around 900m (2700ft). ice axe, harness, daisy chain, couple of screw gate carabiners, backpack with ski carrier as well, around 30-35l, headlamp, avalanche transceiver, shovel and probe. For further details, info and booking, drop me an email.